One of the big three games that Nvidia's CEO Jensen Huang showed off during the launch of the GeForce RTX 2080 Ti, RTX 2080, and RTX 2070 was the latest Tomb Raider title - Shadow of the Tomb Raider, or SOTTR for short. The official GeForce channel features a SOTTR 4K PC Tech video and an exclusive SOTTR raytracing video, released to support the GeForce RTX graphics cards announcement at Gamescom 2018. If you head on over to the Nvidia blog you will see that SOTTR is one of the relatively few upcoming games that has been flagged for the inclusion of both RT core accelerated real-time raytracing and Tensor core accelerated DLSS technologies. The game was demonstrated on the Gamescom stage with emphasis on the great lighting, shadows, and realism seen as the game was played. A great deal of time on stage was taken up toggling RTX on/off in a scene with many different light sources. The action looked smooth with RTX on and off but in this demo, nothing was stated about any impact on gaming frame rates. After the show PCGamesHardware.de captured some demo footage of SOTTR running on the new Nvidia GeForce RTX 2080 Ti (with a decent set of supporting PC components). The demo was running the game in 1080p with RTX turned on. 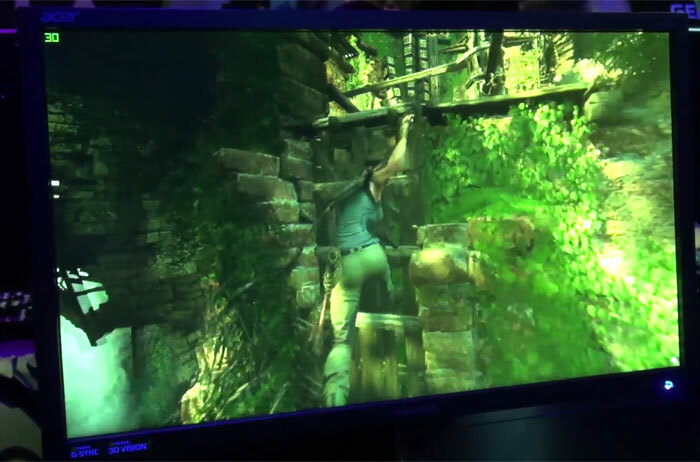 In the video you can see that the computer has an fps overlay in the top left corner and this metric fluctuates between approx 30 to 70 fps as the title is played - Lara jumping around and exploring the environment (see screen grab above). Remember, this is 1080p and not 4K PC gaming. SOTTR developers were spurred to respond to the video, and reported frame rates, on Twitter yesterday evening. It was explained that "The Nvidia Ray Tracing technology currently being shown in Shadow of the Tomb Raider is an early work in progress version. As a result, different areas of the game have received different levels of polish while we work toward complete implementation of this new technology." In a follow up Tweet the game developers added that the final raytracing code implementation will be released post-launch and they remained excited for Tomb Raider fans to experience the tech on their home systems. The above statement seems to water down the promises made in a pinned Tweet on the official Tomb Raider feed. 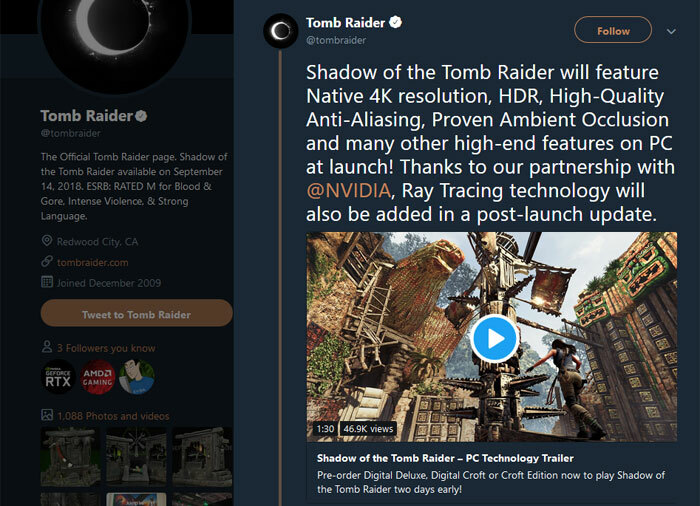 A Tweet from this Monday stated that "Shadow of the Tomb Raider will feature Native 4K resolution, HDR, High-Quality Anti-Aliasing, Proven Ambient Occlusion and many other high-end features on PC at launch". One wouldn't expect to have to tune these settings down to 1080p for playability with 'RTX on' using a top of the range Nvidia GeForce RTX 2080 Ti. SOTTR is released on 14th Sept, nearly a week before the first GeForce RTX 20 Series graphics cards arrive. We hope that optimisations in the game, and in Nvidia's driver software, can make 'RTX on' a setting worth selecting. AFAIK,RTX won't be in the game at launch. Reminds me of when tesselation game out with DX11 and Fermi. It was clearly a massive leap forward for geometry, but just a bit too taxing for the hardware at the time. If ray tracing destroys framerates this much at just 1080p, then it'll be a few years before it's truly a viable tech. So does this mean that Nvidia shoe horned in Ray Tracing last minute.com then?